What greenhouse materials can we help you to get? HORTOMALLAS offers you a complete range of trellis netting and protection for plants. We would like to be your supplier of greenhouse materials, i.e. supplies pertaining to providing support for vegetable plants or flower crops. The HORTOMALLAS team of biologists and agronomists specializes in providing products that are the answer to crop trellising needs in greenhouses, especially high tech ones such as hydroponic greenhouses. A greenhouse is the best way to leverage vegetable production to the maximum because it puts one in control of climatic elements such as moisture, light intensity, temperature, and watering. Nutritional elements are also controlled, and with antivirus netting, vectors (transmitters of viruses and other plant pathogens by means of physical contact) such as whiteflies and thrips are kept away from crops. In advanced systems of fertilization in a greenhouse (or shade house), the fertigation system is connected to a monitoring system that notifies when the plant is lacking some elements, which are then added to a mixing system, in order for the drip irrigation system to administer the exact dose directly to the root system, be it to provide nutrients or to control plant pathogens systemically. 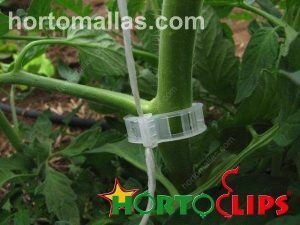 Tutoring rings (trellis clips) or tomato clips or vine clips represent a big advantage in regards to labor at the time of putting up crop support, be it twine or, much better, HORTOMALLAS trellis netting. Having access to the best greenhouse materials at a good price along with the trustworthiness of a supplier like HORTOMALLAS, guarantees the grower success with supplies for protecting crops. 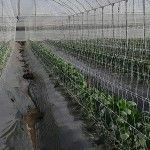 Using trellis netting improves results by making for better air circulation and trellis netting for flowers (used in horizontal layers) helps flowers to grow upright with straight stems and consequently with greater commercial value. Using tomato clips (tutoring ring), be it with the outdated system of trellising made with twine or the advanced system of support for vegetable crops by HORTOMALLAS, it provides considerable savings in man-hours. Please contact us and, if we do not make it, we would be delighted to come up with a way of providing you with a solution by inventing a new product.